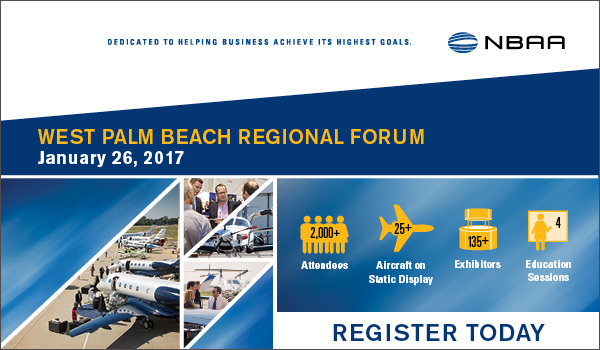 Join the business aviation community on January 26, 2017 for the year’s first NBAA Regional Forum at (PBI) Palm Beach International Airport! Whether you’re going as an exhibitor, to mingle with the crowd or interested in purchasing a private jet yourself, chartering a private flight through Palm Beach Jet Charter is the most comfortable, convenient and stylish way to get there. Current and prospective business aircraft owners, operators, manufacturers, customers and other industry personnel can network with other aviation professionals and learn more about the needs of local aviation communities. The NBAA Regional Forum at PBI Palm Beach International will feature a variety of static displays where you’ll be able to check out and board the newest, state-of-the-art business aircraft. Palm Beach Jet Charter can arrange your flight to land right in the middle of the action at one of the busiest business aviation airports on the Atlantic coast, (KPBI, PBI) Palm Beach International Airport. Need to find a nice hotel while you’re in West Palm Beach for the forum? Check out our Palm Beach Jet Charter page, with a list of the top four and five-star accommodations in the area. If you’re interested in becoming an NBAA Member and would like to register for this event, click here. Request a Quote or give us a call at 1-888-987-5387 to speak with one of our PBI Private Jet Charter representatives to book your private flight to the NBAA Regional Forum at (PBI) Palm Beach Int’l Airport!